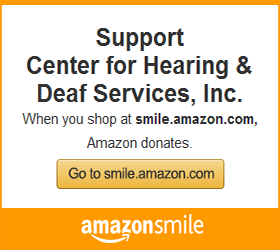 Established in 1989, the Assistive Device Center (ADC) at the Center for Hearing & Deaf Services, Inc., offers the most extensive display of assistive products currently available for individuals who are deaf or hard of hearing. In the past, most of these products could be purchased only through catalogues. Since products ordered through the mail did not provide the opportunity to “try before you buy,” they were often found to be unsuitable for the purchaser’s needs. Now individuals can come to the Center, and a trained professional (skilled in sign language) will help them select a device that meets their needs and budget. Testing and demonstrations are always encouraged. Due to rapidly changing technology, inventories at the Center are continually updated. The Assistive Device Center is also an important resource for professionals serving the needs of people who are deaf or hard of hearing as well as for hospitals, nursing homes, theaters, places of worship, educational facilities, places of employment, and many others. Customers are encouraged to make an appointment, but walk-ins are also welcome. The ADC accepts multiple methods of payment, including: cash, check, money order, Mastercard, Visa, Discover, American Express. Customers are allowed a 10-day trial period during which they may use the products in their homes or workplaces. If customers find that a particular device does not suit their needs, they may return it within 10 business days for a full refund. A wide range of devices have been designed to help persons who are deaf or hard of hearing respond to traditional signals or alerting sounds they cannot hear at home or at work. These products can bring a sense of security, peace of mind, and ultimately, more independent lives. These products improve the quality of sound and are particularly helpful in noisy environments or when listening to sounds coming from a distance. For a person who is hard of hearing, these devices make a profound difference when watching televisions with other people, talking to a companion in a group setting or a crowded area like a restaurant, or listening in a classroom, place of worship, theater, etc. It is important to note, Assistive Listening Devices are not intended to substitute for a hearing aid. Instead, they extend the “reach” of a hearing aid in order to distinguish and pick up selected sounds where there is background noise. A TTY/TDD is a specialized device that allows persons who are deaf, hard of hearing or speech impaired to use the telephone. When a call is placed, conversations occur by using a keyboard to type messages that appear on the units display screen. With these devices, individuals with impairments no longer need to rely on neighbors, co-workers and relatives to make and receive phone calls. Amplified telephones and telephone amplifiers make conversation louder and clearer. These products can amplify incoming voices up to 55dB and some have tone selectors to help distinguish between similar sounding words. Amplifiers can be portable carried in a pocket or purse, while others are more permanent like an amplified handset. Additionally, amplified telephones are available with large keypads and flashing ring signalers. The Assistive Device Center has many other products for use at home, in the car, or in the workplace. Please call for more information: 412-281-1375 (v/tty).